Review Summary: An intriguing plot is not enough to overcome shabby execution. '7 Hours to Go' probably had promise at the scripting stage, but fails to keep your attention in the cinema. There's not a single reason why you can recommend 7 Hours To Go. Perhaps if the director had tried not to copy every Hollywood film he ever watched. Hollywood reruns on TV offer better prospects. ­ACP Ramesh Dhadke (Varun Badola) has no option but to call Shukla-ji to take charge of the case. An angry young man takes seven hostages and asks the police for the head of a super rich man who has wronged him. The result is loud, chaotic and mostly pointless runaround. You want to empathise, take sides - the cops or the hostage taker - but the story is too convoluted for us to care. 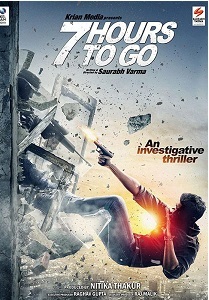 7 Hours to go' makes for an edge-of-the-seat entertainer. An angry young man takes seven hostages and asks the police for the head of a super rich man who has wronged him. The result is loud, chaotic and mostly pointless runaround. All we could realize was the style overshadowing the real substance of the film.